Okay so it’s not exactly a new brand, but it’s definitely new to me! I discovered Glossier through Instagram a couple of months ago, and decided to order some of their cult products to see what all the fuss was about. I wanted to use them for a few weeks before writing about them, just to make sure I liked them. I picked up the Glossier Milky Jelly cleanser because I’d heard so many people rave about it, and I’d recently ran out of my Liz Earle Cleanse and Polish. This hasn’t disappointed at all, it’s lovely! I’ve never used a cleansing ‘milk’ before, only creams, but the texture was lovely. It feels like more of a gel than a cream which was a nice change because it’s quite cooling on the skin. It says to apply on damp or dry skin and then rinse. I’ve tried to get into the habit of using it in the morning as well as in the evening because it’s really refreshing. I think it was only £8 for the bottle as well which is amazing! I also picked up the Glossier Boy Brow, mainly because I just can’t be bothered to use a pomade anymore and find it so much easier to just comb a bit of this through my brows and leave them more natural. Medium is the perfect shade for me and it keeps my brows in place all day. It’s so much quicker to use a product like this, which is a bonus when you’ve got a toddler/ aspiring makeup artist sat beside you. My favourite product from this mini Glossier haul has to be the Priming Moisturiser. I’ve been using this one product every morning religiously before applying my makeup rather than using a moisturiser and then a primer. Obviously they named it very well because it actually is the perfect balance between a moisturiser and a primer. The texture is creamy but light and sinks in really quickly, leaving the perfect base for my makeup. I’d recommend this to anyone who usually wears a day moisturiser and then a primer because I just use this now and I’ll definitely be repurchasing. I actually also got the Glossier Rose Balm which is beautiful but I wish I’d got the birthday cake scent because I feel as though I’d wear that one more. The balm itself is lovely and I’ve been using it before bed and leaving it on overnight to let it soak in because it’s quite thick. I always feel like I’ve pampered if I put lip balm on at bed time ha! 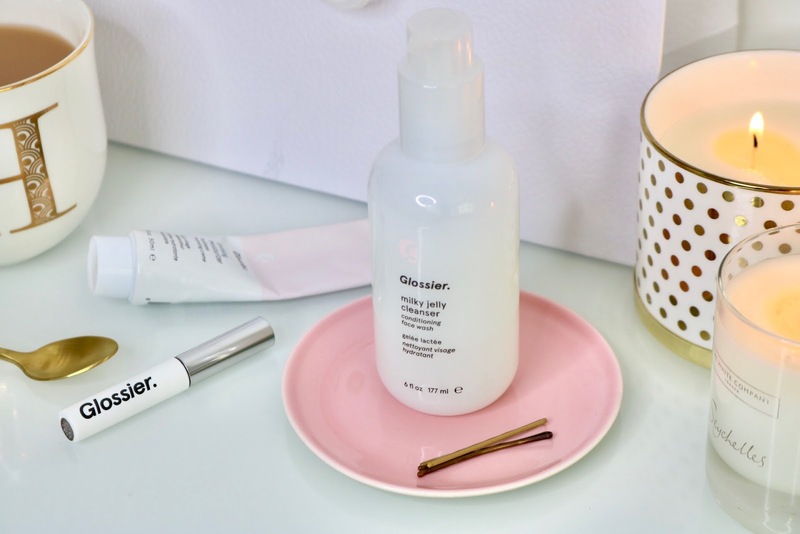 That’s everything I got from Glossier, definitely a new favourite brand and one I’m keen to try more of in future! I'm thinking of making this into a little series alongside my Wedding Diaries, and trying out new brands every so often and seeing what products from them I like the most. Let me know if you think this is a good idea! 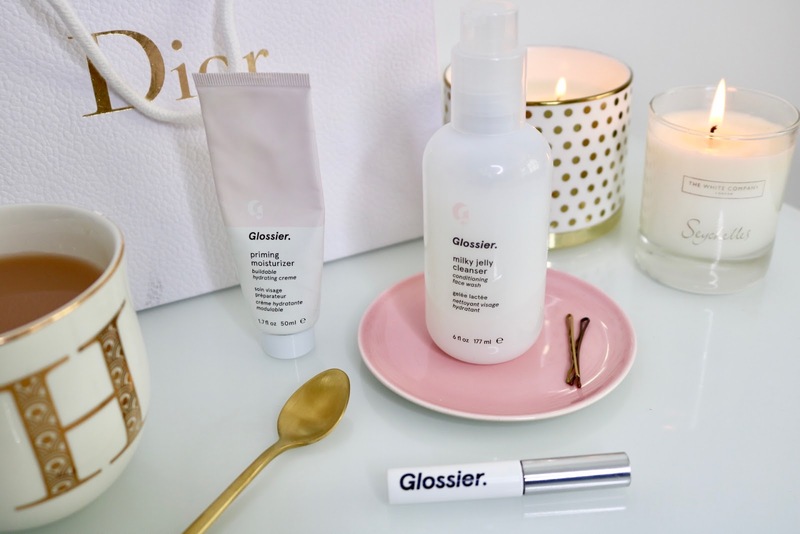 I've never used any glossier products but I'm tempted! The primer/moisturiser sounds SO ideal for those quick makeup mornings! i still haven't tried anything bigger than a sample size from glossier, they were massive but seem to have fallen a bit quiet recently so i will defo be trying them out now that the die hards are left! I really like the cleanser and the priming moisturiser. I've only tried the glossier balm dot com, and i really liked it! i deffo fancy trying the milk jelly cleanser!